A solar panel uses a layer of p-type silicon and a layer of n-type silicon. This way, when light is absorbed and the electrons in the n-type layer increases in energy, the electrons will be able to travel from the n-type layer to the ‘holes’ in the p-type layer. This electrical current is what allows solar panel technology to convert light energy into electricity. Production techniques of solar cells include the Czochralski process, float-zone method, and thin film deposition. The removal of surface impurities and defects in the silicon is of critical importance, and is addressed with techniques such as surface passivation and gettering. Solar Power Stations Solar Power Stations are complete, integrated systems designed for site loads requiring 12/24/48VDC or 110V-240V, 50Hz/60Hz AC voltage. The Power Stations provide safe and reliable power without the expense of installing utility power. 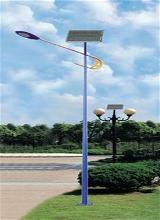 The solar array tilt is easily adjustable to maximize solar energy output. The systems are mounted on galvanized steel structures or trailers engineered to withstand harsh environments and high wind loads. 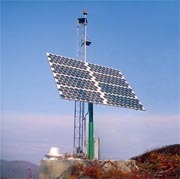 Geoking solar power stations provide continuous DC power with battery backup from a DC source. These fully-integrated, galvanized units use DC primary power to charge a 12, 24 or 48 VDC sealed battery bank while powering the DC load, or AC load with integral inverter option. Solar Universal Power Systems Solar Universal Power Systems are complete, fully integrated solar power supplies designed for site loads requiring 12, 24 or 48 volts DC. Each solar power system provides safe and reliable power generation without the need and expense of installing utility power. The sealed, maintenance free batteries are designed for deep cycle operation and extended life in solar applications. Solar Lighting Systems Solar Lighting Systems are complete, fully integrated solar power supplies designed for site loads requiring withstand harsh environments and high wind loads. Geoking Power Stations provide continuous DC power with battery backup from a DC source. These fully-integrated, galvanized units use DC primary power to charge a 12, 24 or 48 VDC sealed battery bank while powering the DC load, or AC load with integral inverter option. Off-Grid Cabin Solar Power Residential solar power systems allow you to generate clean, renewable electricity right at your home, reducing your utility bills. Although the photovoltaic technology is complex, the resedential solar power systems are simple to install and maintain. Home Solar Backup The solar power backup systems are designed to run small office or household loads such as lights, radio, TV, VCR, computer, microwave, small refrigerator, or any combination of simultaneous loads up to either 1500 or 2400 watts..
Portable Solar Power Systems Portable Solar Power is ideal for providing electrical power and light for remotehomes, emergencypower, disaster relief, camping, boating - anywhere you need power on-demand with no fuel-costs or pollution. Mobile Solution- SOPOTO: A State-of-the-art Solar Power Trailer Our latest desigined compact solar power trailer is available to the market now. 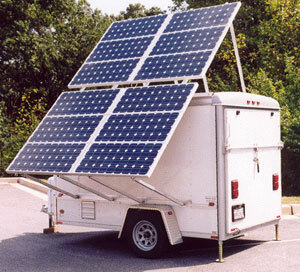 It is compact, light-weight, powerful, dual-charge (DC/AC), mobile solar power trailer.